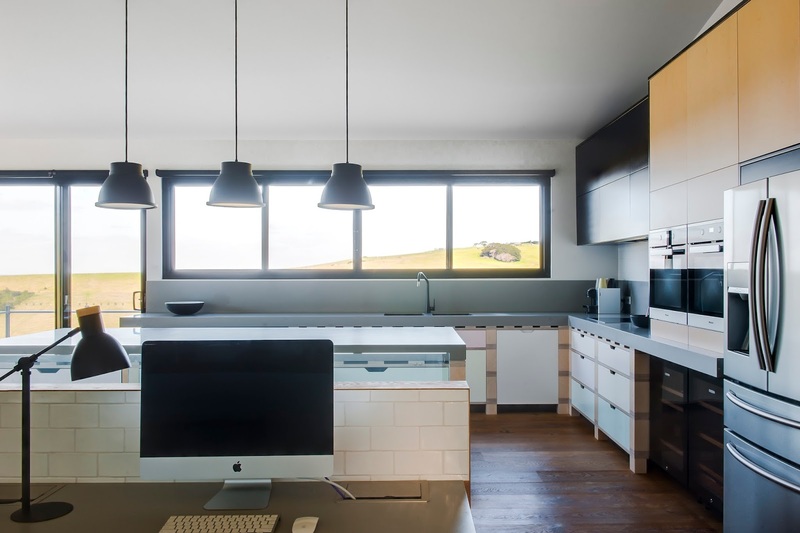 We could only describe this as one of the most exciting and challenging kitchens and interior spaces we have created, it had all the joy of creating a kitchen that is a one off and the struggle of getting our joiners to embrace such a unique construction method. 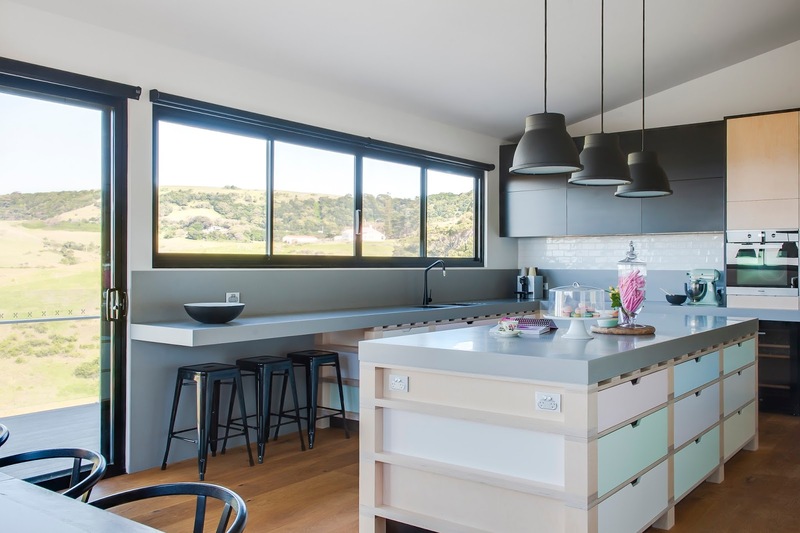 The end result after all the challenges is nothing short of incredible, we love the robust yet playful nature of this kitchen. It had to serve as the centre point of this holiday house, scroll thru and read our design statements. 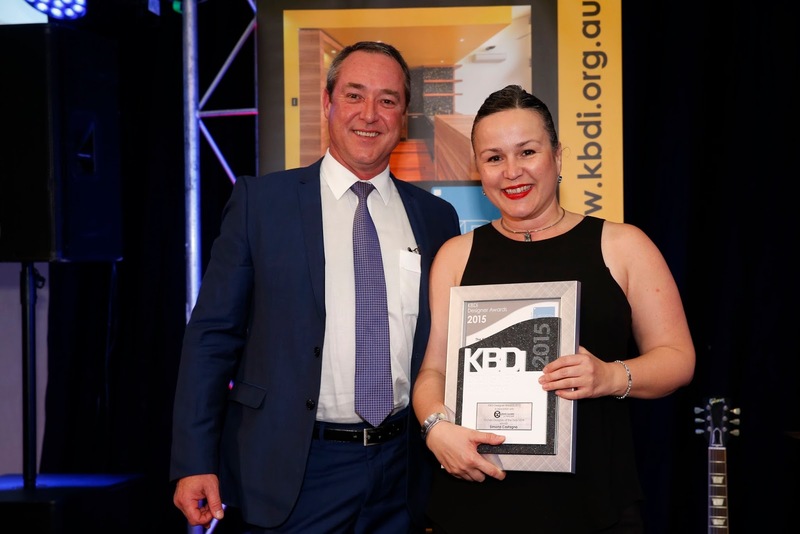 This kitchen was just awarded the KBDi NSW kitchen design of the year for 2015 - See below for the Media Release and what the judges had to say about this wonderful Kitchen Design. Enjoy. Rolling green hills, crystal blue water and the brightest of bright sky… What a view! 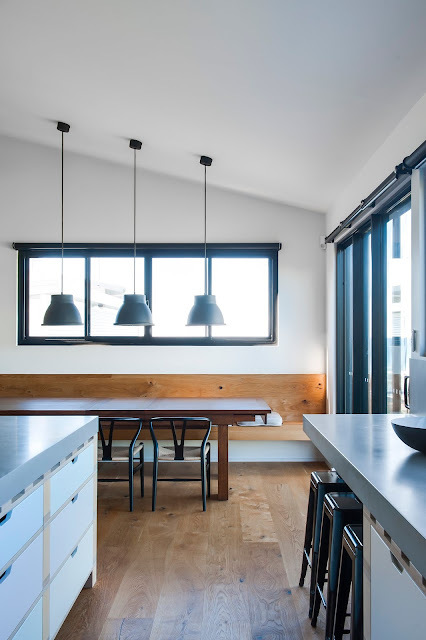 This renovation project was situated in the lovely town of Kiama on the south coast of NSW. The house a 60’s fibro weatherboard clad two bedder. A holiday home to a family with three teenager daughters and many friends! The house was a significant part of their lives and unlike most holiday homes – it is actually utilized often and sometimes for long stays. The client engaged the design services early to spatially plan their “living areas” for their wonderful chilled holiday home. 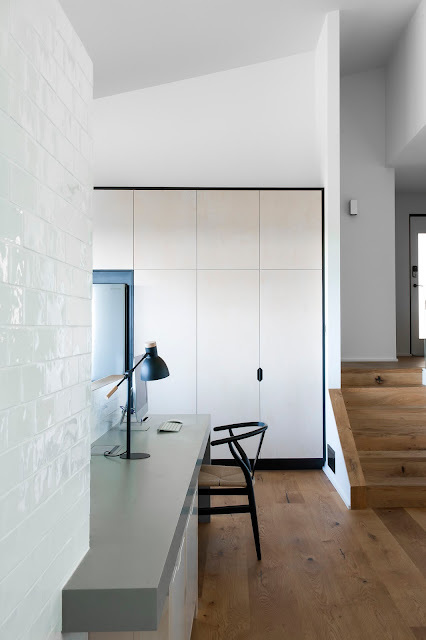 Initially the renovation was looking great – on paper. Finally we received notification that council had rejected most of the improvements. This meant that we had to revert to the existing footprint and not a sq. inch more! Tough. 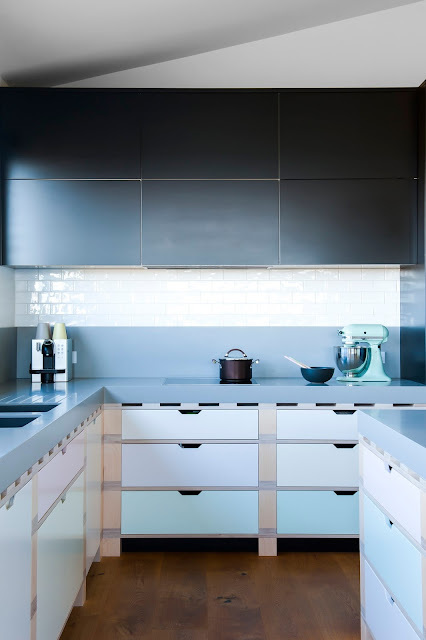 · Kitchen had to be communal, guests need to be able to congregate and help out. · Not pretentious design- a beachy feel. · The area had to incorporate FAMILY times - dining lounging socializing quiet time. · Double ovens, double sinks, double dishwashing & double ref – MUSTS! · Incorporate home office for dad to run his business without leaving the action. Should your holiday house be similar to your day-to-day residence? The designers felt not, and with the brief to make it “beachy” and relaxed the designers re-created an area where family and guests can come together, cook or chill out, feeling very welcome in a awesome space. With inspiration from the large grazing table the clients owned & the humble pallet (used in transport and warehousing). The pallet signifies movement, from one space to the next. It signifies strength and robustness; and the grazing table signified a place of gathering, good times and great celebration. Our client is a gourmet cook, with gourmet friends and their kids loved to bake so the kitchen needed to be able to cater to a lot of people standing around assisting in the process. It was decided that a large L shape with central island layout was the correct spacial plan for this to take place. Within the L shape, casual sitting was to the end near the sliding doors; perfect for those mornings reading the paper over breakfast. Or just gazing out! Continuing along that section ALOT of doubles were housed. Double DW and double sinks with large double bins under the sink zone. The client was happy as the designer ticked many components off the brief. Continuing around the L section the cooking area a 900cm wide induction) was placed with two wide banks of drawers under. Here all her cooking paraphernalia could be stored and utilised with ease. 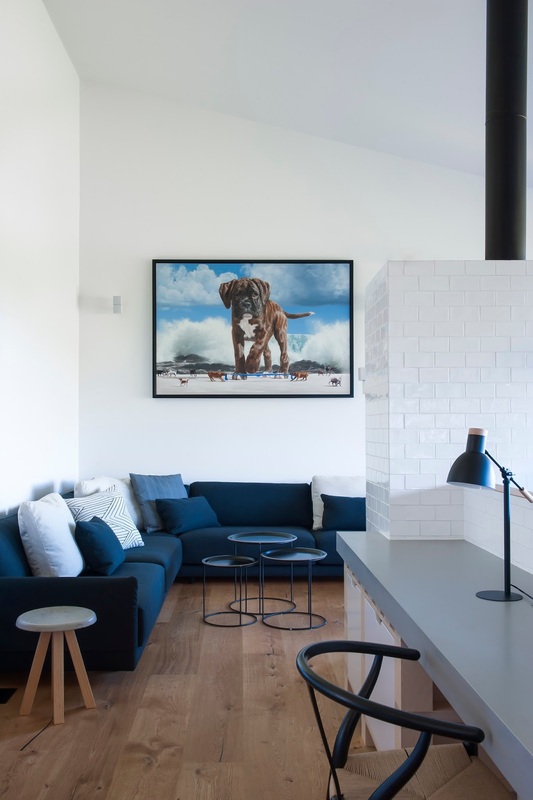 Above a powerful rangehood was installed yet hidden from view to ensure the space was cleared of cooking odours efficiently. Beside two oven towers housed more cooking and below bench two wine ref – for all their entertaining. 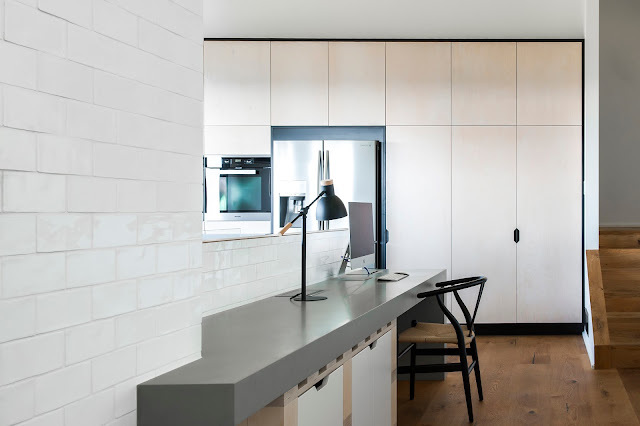 To create a felling of length the cooktop benchtop intersects the tall section of joinery and acts as a small server set-down to the bar fridges below. The large double door refrigerator resides beside these ensuring work flows are comfortable. 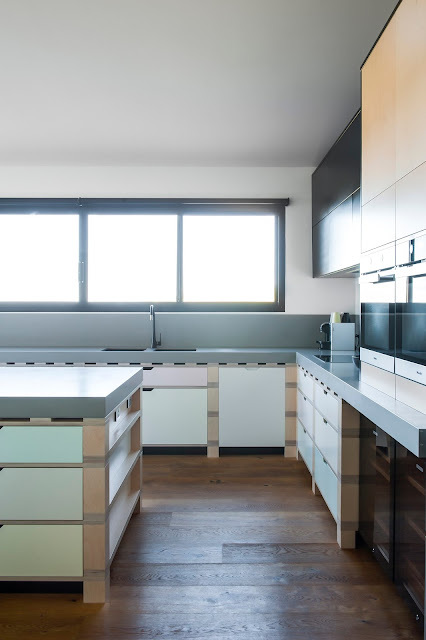 The kitchen also had to store the homes linen, and the designer chose to add tall cabinets to complete the L section. All the tall elements backed on to the kids’ bedroom, this gave an extra layer of soundproofing and also put most of the tall elements behind you on arrival, taking nothing away from the rolling hills. 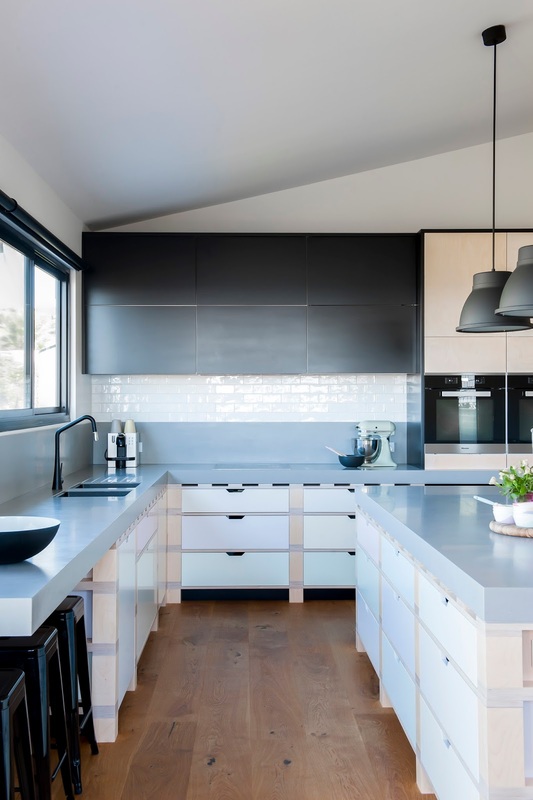 It also meant that all the appliances functioned away from the grazing island unit, creating the perfect active and passive areas to this kitchen area. 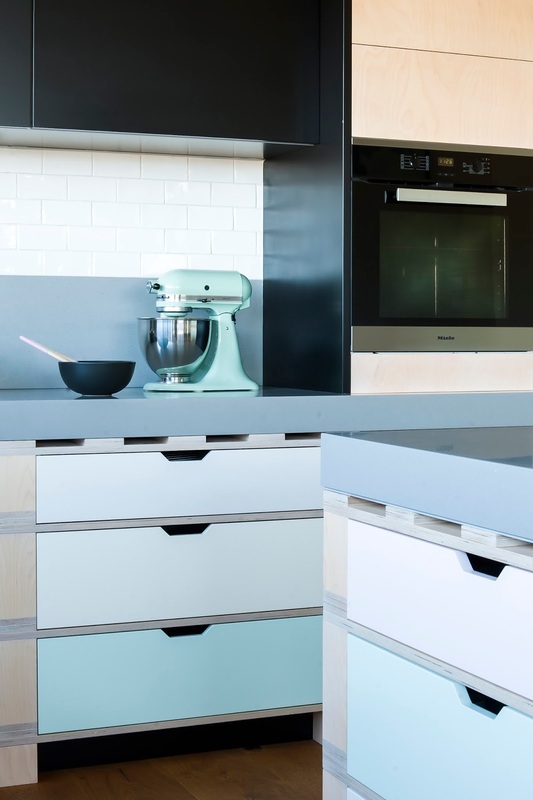 With the natural pallet like appearance of the kitchen, the designers chose to insert a few pastel colours for fun and to also add to the relaxed feel of the interior. 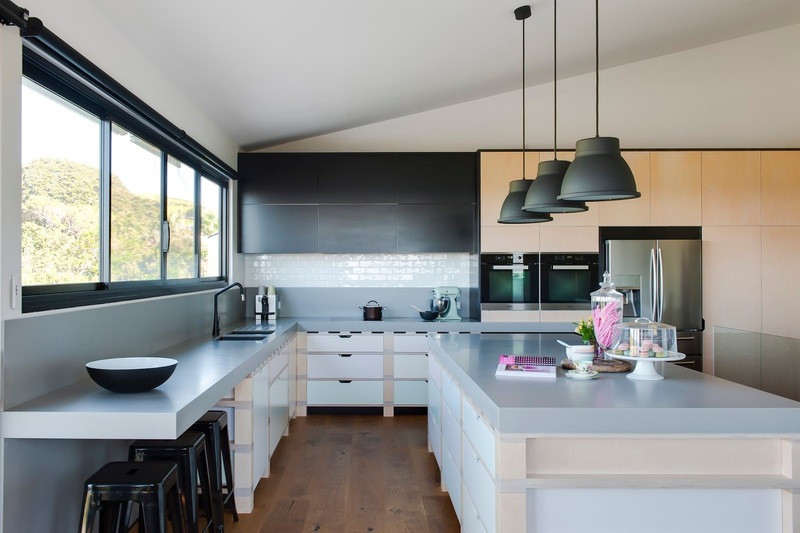 Black highlights such as the pendant and overhead cabinets we included to compliment the clients chosen interior palette. To enhance the industrial like nature of the pallet shape, the designer wanted concrete benchtops. However as the client was hesitant, a solid surface material was chosen to reflect concrete. Overall cementing the robustness of the design. 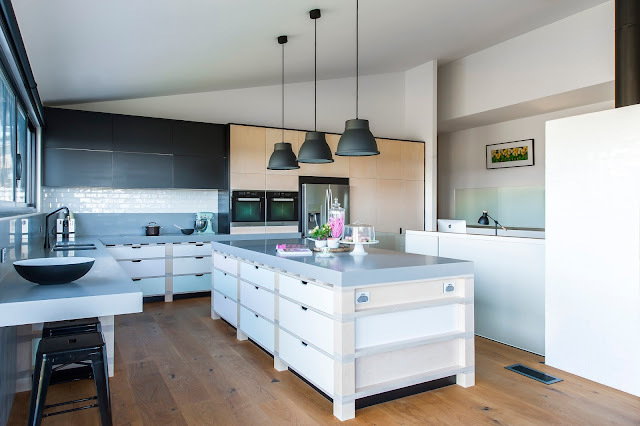 We hope you have enjoyed this amazing kitchen design and overall space, it was a real pleasure to create and we are thrilled with the results of this unique kitchen and inter design. 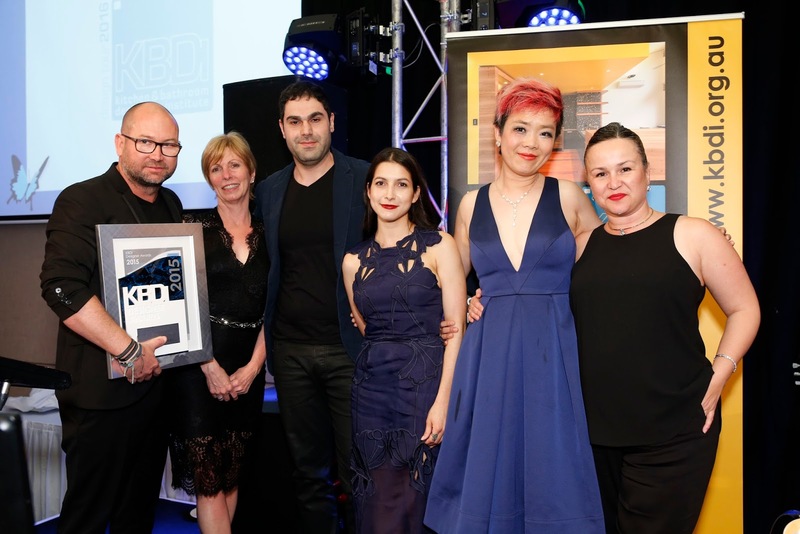 Sydney designer, Simona Castagna of Minosa (www.minosadesign.com), has been awarded the title of KBDi Kitchen Designer of the Year 2015 – NSW, at a spectacular gala event on Saturday night (29 August).